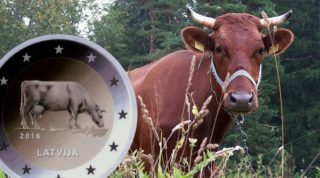 The Bank of Latvia has released a new special circulation 2 Euro coin entitled ‘Latvijas brūnā’ or ‘Latvian Brown Cow’. Prior to introducing the Euro, the Latvian 2 Lats coin had an image of a cow on it. The design of the national side of the coin was by Gunārs Lūsis (graphic design) and Jānis Strupulis (plaster model). The coin was minted by UAB Lietuvos monetu kalykla (Lithuania).